The MK910 is a high-performance CLS-compatible speedlight with a large guide number of 42(ISO 100/M)(111.5/157.5 ft.)(at the 35mm zoom position in Nikon FX format with standard illumination pattern). -Advanced wireless lighting, with advanced wireless lighting, wireless multiple flash operation in the TTL (i-TTL)mode can be accomplished with CLS-compatible digital SLRs. 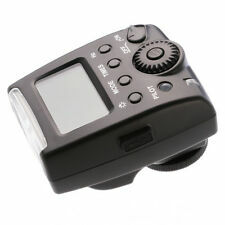 Flash can rotate 60 - 90 degree horizontally and -7 - 90 degree vertically, weight about 150g, small and easy to carry. Excellent Flash unit at a low price. Comparable to Nikon 900 Level Professional flash units. Smoke free home and stored in original case. Only used a handful of times. Electronic Flash AR-4378 Meikai. The flashes in the original package original plastic comes with manual booklet never used never opened box has a little wear from shelving I accept PayPal Condition is New. Shipped with USPS Priority Mail. With advanced wireless lighting, wireless multiple flash operation in the TTL (i-TTL)mode can be accomplished with CLS-compatible digital SLRs. The MK910 is a high-performance CLS-compatible speedlight with a large guide number of 60(ISO 100/M)(111.5/157.5 ft.)(at the 35mm zoom position in Nikon FX format with standard illumination pattern,20°C/68°F.). We do our very best to make sure our samples are as close to the exact product as possible, but due to the many variations in monitors and browsers, color samples may appear different on different monitors. Support to TTL, Master HSS, Multiple mode, S1/S2 mode, Manual mode, Tributary unit flash Specification: Product Model: MK320N Flash Type: Small flashlight Fit for: Nikon Coverage: 24mm Recycle Time: About 5 sec Flash index: 32(105mm focal length, ISO 100 meters) Flash mode: TTL/M/MULTI/S1/S2/high-speed main control/tributary unit flash Illumination angle: Up-down rotation angle (down by -7 degree and up by 90 degree), left-right rotation angle (left by 60 degree and right by 90 degree) Power supply mode: 2 pieces of alkaline cell or AA NI-MH battery (not included) Color temperature: 5600K. 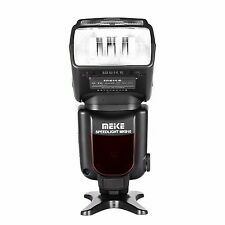 Meike MK-14EXT MK-14-EXT ITTL Macro TTL Ring Flash AF Assist Lamp For Nikon US ! Specifications: Weight: 398g（Ring flash only） Size: 191X77X60mm Power supply: 4 AA alkaline batteries or AA NI-MH batteries Gudie NO: 14 Flash mode: TTL/Lamp A flash/Lamp B flash /AB Lamp flash ratio mode/ Manual outputrepeating flash/ Flash times: 100-800 times(under AA alkaline battery) Recycle time: about three seconds(under AA alkaline battery) Color temperature: 5500K Flash duration: 1/200-1/20000seconds Light induction distance: Indoor 15 meters, 10 meters outside FLASH COMPATIBLE ON CAMERAS Nikon: D7000, D5000, D5100, D3200,D3100, D3000, D3 series, D800,D700, D2 series, D300 series, D200, D90, D80s D70 series, D60, D50, D40 series, F6 Nikon COOLPIX: COOLPIX8800, COOLPIX8400, COOLPIX P5000, COOLPIX P5100,COOLPIX P6000 Package includes Macro Ring flash(1) protecting bag(1). 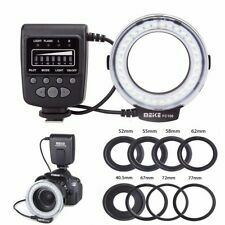 Meike MK-14EXT LED Macro Ring Flash for Nikon (New open item) comes with everything shown in pictures. (Untested with a Camera) Only tested with batteries to see it functions. "Batteries not included" SELLING AS IS... SALES ARE FINAL ! Sony RX100M2, RX1 ， RX1R, ILCE-600 (A6000), ILCE-7/7R/7S/7MII(A7/A7R/A7S/A7II). 1 MK320-O Speedlite. Support TTL. Flash mode: TTL, M, RPT, S1, S2. Support Manual Flash (S1/S2 mode). Support Stroboscopic mode. What's more, the MK-300N Small and Spry, make the shooting available ,anyting and anywhere. More function and A variety of optional flash mode: TTL/ M/RPT. LCD display. -Flash mode: TTL, M, RPT. -LCD display. 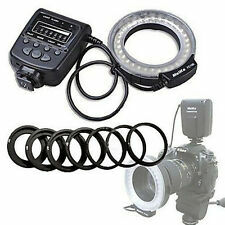 Meike MK-14EXT LED ETTL Macro Ring Flash For Canon 5D II III 6D 7D 60D 700D US !. Support to TTL, S1 mode, S2 mode, Manual mode Specification: Brand: MEIKE Product Model: MK320 F Flash Type: Small flashlight Fit for: Fujifilm Coverage: 24mm Recycle Time: About 5 sec Flash index: 32(105mm focal length, ISO 100 meters) Flash mode: TTL/M/S1/S2 Illumination angle: Up-down rotation angle (down by -7 degree and up by 90 degree), left-right rotation angle (left by 60 degree and right by 90 degree) Power supply mode: 2 pieces of alkaline cell or AA NI-MH battery (not included) Color temperature: 5600K Light sensing distance: 15 meters indoor and 10 meters outdoor. Canon flash light 580EXII, 580EX, 550EX, MR-14EX, MT-24EX. Nikon flash light SB-11, SB-20, SB-22, SB-24, SB-25, SB-26, SB-27, SB-28, SB-28DX, SB-80DX, SB800. Sony flash light HVL-F56AM. 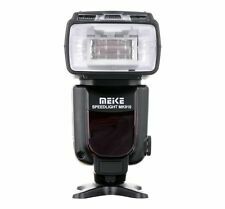 MeiKe Mini Speedlite MK-320N LCD i-TTL M RPT GN32 Flash LED Light For Nikon SLR. Shipped with USPS Priority Mail. 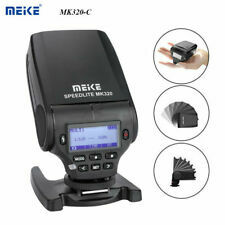 Meike FC-100 LED Macro Ring Flash Light For Canon Nikon Olympus Fujifilm US !. 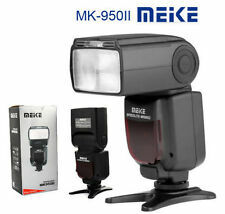 4.5 out of 5 stars - Meike FC-100 LED Macro Ring Flash Light For Canon Nikon Olympus Fujifilm US ! 13 product ratings13 product ratings - Meike FC-100 LED Macro Ring Flash Light For Canon Nikon Olympus Fujifilm US ! 240 Pcs 18" 5500K Dimmable LED Adjustable Ring Light Package Including: 1 x 18" LED Ring Light 2 x Orange Plastic Filter 2 x White Plastic Filter 1 x Ball head (GIFT) 1 x Phone holder (GIFT) 1 x US Power Cable (GIFT) 1 x Carry Bag Description . Built with 18 pieces high intensity LED's, this Mcoplus macro ring flash illuminates the subject, no matter how low the lighting conditions are. Equipped with pre-flash system, this Mcoplus macro ring flash allows you to turn on either full illumination or partial illumination, depending on the lighting situation. Fujifilm X-T2 X-T20 X-T1 X-T10 X-Pro1 X-Pro2 X100F X100T X100s X3O X70 X-A2 X-E1 X-M1 etc. The speedlite will recover the last mode and setting when it is turned on again. Flash mode:TTL M S1 S2. Flash Exposure Compensation. 18 LEDs for even, shadowless lighting in the flash or constant light mode. 7 flash output settings: 1/128, 1/64, 1/32, 1/16, 1/8, 1/4, 1/2, 1/1. Flash guide no. 18. TTL/ Lamp A flashing/ Lamp B flashing/ TTL mode/ AB Lamp brightness ratio mode/ Manual mode/ Multi. Feature: The Macro Ring Flash can produce a ring of light that reduces shadow which is suitable for macro shotting. Support to TTL, Multiple mode, S1/S2 mode, Manual mode Specification: Brand: MEIKE Product Model: MK320S Flash Type: Small flashlight Fit for: Sony Coverage: 24mm Recycle Time: About 5 sec Flash index: 32(105mm focal length, ISO 100 meters) Flash mode: TTL/M/MULTI/S1/S2 Illumination angle: Up-down rotation angle (down by -7 degree and up by 90 degree), left-right rotation angle (left by 60 degree and right by 90 degree) Power supply mode: 2 pieces of alkaline cell or AA NI-MH battery (not included) Color temperature: 5600K Light sensing distance: 15 meters indoor and 10 meters outdoor. Advanced wireless lighting, with advanced wireless lighting, wireless multiple flash operation in the TTL (i-TTL)mode can be accomplished with CLS-compatible digital SLRs. Weight: 405g (Speedlite only, batteries excluded). (2)Flash mode: TTL,M(S1/S2 mode),RPT. MK-320 Flash Light x1. Flash Stand X1. Flash Diffuser X1. 5)LCD Lattice screen. Suitable for Protecting Bag x1. 9)Support rear-curtain synchronous. I have only used this flash once or twice so it is in excellent condition and has been in the pouch with the work "Canon" written across the pouch. It has barely been used. (Leica X2 Leica D-lux6 Leica M Leica S Leica X Vario Leica V-LUX4 Leica M-E Leica D-lux6 Leica M10. 2)Flash mode: TTL,M(S1/S2 mode),RPT. Features : TTL. MK-320 Flash Light x1. Flash Stand X1. Flash Diffuser X1. •TTL function for Nikon. This LED Macro Ring Flash for Nikon with LCD Screen is the perfect choice for the photographer who requires shadow free illumination. Includes 7 ring mounts (52mm, 55mm, 58mm, 62mm, 67mm, 72mm, 77mm) for different lenses. Support TTL. Features : TTL. Support Manual Flash (S1/S2 mode). 1 x Flash Stand. LCD Lattice screen. MPN : Does Not Apply. UPC : Does not apply. Light Type : Xenon. (Fujifilm X100T X100S X30 X20 X-E1 X-E2 X-A1 X-T1 X-Pro1 X100 X10 X-S1 X-M1. It is quite suitable for Fuji series. The speedlite base can be rotated up-down and left-right. TTL function 2)Flash mode: TTL,M(S1/S2 mode),RPT. Trending at $61.49eBay determines this price through a machine learned model of the product's sale prices within the last 90 days. 5 Brightness setting. Flash and video modes. MK-320 Speedlite x1. Apply for:FujiFilm X-T1 X-M1 X100s X-a1 X-e2. Precise LED dispaly screen, high-quality vision enjoying. Flash Stand x1. Elegant design, delicate and small appearance, weight only 150g, convenient for carry. The Macro Ring Flash can produce a ring of light that reduces shadow which is excellent for taking macro shots. The Flash tube is mounted in front of your lens producing light that wrap around the objects.